Almotamar.net, Google - Ten people were killed and more than 100 injured in Tehran during yesterday's protests, state-run television said today, as Iran was braced for the possibility of further post-election confrontations. State television said the deaths happened during clashes between police and "terrorist groups". Reuters reported that two gas stations were set on fire, citing Iran's English-language Press TV, which described the culprits as "rioters". Thousands of protesters clashed with black-clad police wielding guns, truncheons, tear gas and water cannons. Amateur video showed the demonstrators pelting police with stones and shouting: "Death to the dictator!" Scores of injured protesters who had sought medical treatment were arrested by security forces at hospitals in the capital, the International Campaign for Human Rights in Iran claimed. It said doctors had been ordered to report protest-related injuries to the authorities, and some seriously injured protesters had sought refuge at foreign embassies in a bid to evade arrest. Early today, Tehran's streets were quiet and there were no signs that security forces were massing. Supporters of the opposition leader Mir Hossein Mousavi claim that widespread fraud in the 12 June elections robbed him of victory and kept the hardline president, Mahmoud Ahmadinejad, in office. Yesterday's clashes along one of Tehran's main avenues – as described by witnesses – had far fewer demonstrators than recent mass rallies for Mousavi. But they marked another blow to authorities who sought to intimidate protesters with harsh warnings and lines of black-clad police three deep in places. 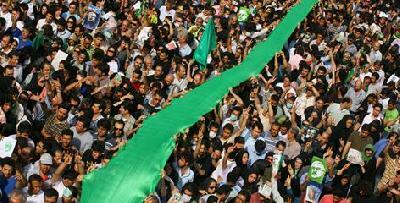 The rallies left questions about Mousavi's ability to hold together his protest movement. He bewildered many followers by not directly replying to the ultimatum issued Friday by Ayatollah Ali Khamenei, Iran's most powerful figure, to call off the demonstrations or risk being held responsible for "bloodshed, violence and rioting". Amateur video showed clashes erupting in the southern city of Shiraz yesterday and witnesses reported street violence in Isfahan, south of Tehran. Other footage posted in the hours after the crackdown showed blood pouring from a young woman's nose and mouth as frantic people tried to help her. Two separate videos of the incident, each shot from a different angle, were uploaded on to Facebook and YouTube. The YouTube video described the location of the incident as Amirabad, central Tehran, and said the woman had been fatally shot. In Washington, Barack Obama urged Iranian authorities to halt "all violent and unjust actions against its own people." He said the US "stands by all who seek to exercise" the universal rights to assembly and free speech.